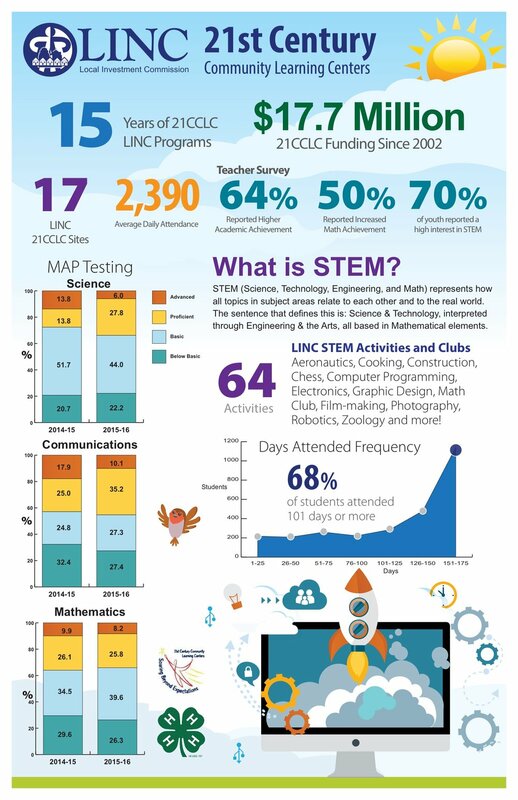 Download an infographic about LINC 21CCLC programs. Based on extensive teacher survey data, 64% of students in 21CCLC programs report higher overall academic achievement and 50% report increased math achievement by students. STEM (Science, Technology, Engineering and Math) is a core feature at all 21CCLC programs. STEM represents how all topics in subject areas relate to each other and to the real world. The sentence that defines this is: Science & Technology, interpreted through Engineering & the Arts, all based in Mathematical elements. Approximately 70% of students in the programs report a high level of interest in STEM and STEM based careers. Watch a video about LINC and 21C.